The Dancers, Diana P. Battefeld, 2015 [Oil on Canvas] Göttingen. After an image captured with the ESO Faint Object Spectrograph and Camera (EFOSC2) through three wide band filters (B, V, R). EFOSC2 has a 4.1 x 4.1 arcminute field of view and is attached to the 3.6-metre telescope at ESO’s La Silla Observatory in Chile. It is mind-boggling to realize that our entire understanding of the universe and its evolution did not begin until 400 years ago; even more incredible is that a little over 90 years ago, we didn’t even know there were other galaxies than our own Milky Way. To put this into historical perspective, the Roman Empire lasted 12 centuries; it began in 23 BC and dissolved in 476 AC in western Europe and in 1453 in eastern Europe . The Middle Ages in western Europe spanned 10 centuries from 400-500 AC up until the 1500’s. Our understanding of Early Universe Cosmology, Late Universe dynamics such as galaxy formation, black holes, etc, began with Kepler in 1601. It is true that the stellar objects we observe with the naked eye, such as the sun, the moon, the planets and the constellations have been studied since ancient times, but the ancients concentrated their efforts on pure thought and experimentation was alien to them. One notable exception is the Greek mathematician and astronomer Hypatia of Alexandria (~370-415 AD), but she was skinned alive for daring to apply the scientific method. Over 1,000 years after Hypatia’s death the scientific method method was used for the first time by Johannes Kepler (1571-1630) when he analyzed Tycho Brahe’s (1546–1601) detailed observations of the moon, planets and hundreds of stars. Only then was the proper motion of the objects in our solar system measured accurately. Nonetheless, a true understanding would have to wait for Newton. Kepler’s three laws are the foundation of planetary motion. His first law states that planets orbit in ellipses, not in circles as was previously believed for centuries; the concept of the circle’s purity and perfection and that the universe could not be anything but perfect, was introduced by the Greeks and was enforced through the middle ages. Even in Kepler’s time, the era of the Renaissance which spanned between the 14th to the 17th century, his own suggestion of this “imperfection” was met with flat refusal and disbelief, even by himself. His second law says that a line segment joining the sun and a planet sweep equal areas in equal time intervals. His third law is also equally important; it states that the square of a planet’s orbital period is proportional to the cube of the semi-major axis of its orbit. These laws were empirical. Based on Kepler’s Third Law, and the simultaneous development of Calculus by German mathematician Gottfried Leibniz (1646-1716) and English physicist Isaac Newton (1642-1726), Newton wrote down his Law of Gravity. Using this physical theory, Newton could derive Kepler’s empirical law; this interplay between empirical law and theory exemplifies the symbiosis between experimental and theoretical physicists. Newton’s discovery is one of the most important in the history of science: Gravity is the major force that determines the dynamics in our Universe on large scales. It is also the force that holds galaxies together. Trying to improve on Kepler’s observations, Italian physicist Galileo Galilei (1564-1642) pointed his telescope to the sky and showed that many more individual stars in our galaxy can be resolved. He published his results in the Sidereus Nuncius. During the Age of the Enlightenment, also called the Age of Reason, at the beginning of the 18th Century or mid 17th Century (there is no consensus about this), science was in vogue. 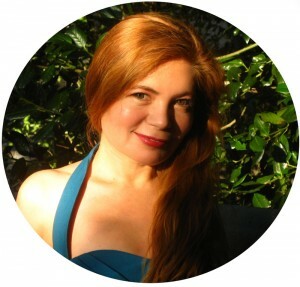 The scientific discoveries of the 17th Century had a great effect on the 18th Century. The technological developments such as Galileo’s invention of the telescope, Torricelli’s (1608–1647) invention of the barometer, Boyle’s (1627–1691) discoveries on the behavior of gases (he is also known as the father of Chemistry), William Gilbert’s (1544-1603) and Benjamin Franklin’s (1705-1790) studies of electromagnetism filled the educated populous with excitement about the understanding of the physical laws governing nature. The philosopher Voltaire studied mathematics and made Newton a celebrity. In the 18th Century, educated people knew that the solar system was kept moving by its own laws and not by magic. Anyone who was “who” dabbled in the sciences. French mathematician and scientist Renee Descartes (1596–1650) introduced the notion of Island Universes. Even those who had no mathematical and scientific background had something to write about. A noteworthy example is German philosopher Immanuel Kant (1724–1804), who based on the assertion made by Descartes, made the foresighted statement in 1761 that the flattening of such Island Universes would be due to their rotation. Contrary to pure philosophy, however, in science, it is repeated experimental observations that give a theory credibility. German Astronomer Frederik William Herschel (1738-1822) was the first to categorize the distributions of stars by counting their number in different locations in our Galaxy. In his model of the universe, the sun is located in the vicinity of the center of a disk of stars. In his measurements, he used the assumption that all stars are equally bright and suggested that the thickness of the disk was about one-tenth its diameter. While not entirely correct, his observations support the idea of a disk-like galaxy. Bright nebulae were first cataloged by French astronomer Charles Messier (1730-1817). His catalogue included not only what we now as true nebulae, but also spiral galaxies; their true nature was not apparent to him due to the lack of high resolution measurements. Messier’s catalogue contains the brightest galactic and intergalactic objects. Today, these bright objects are referred to by the letter M, the Messier number. Frederik William Herschel and his sister Caroline Lucretia Herschel (1750-1848) made a systematic catalog of nebulae and this work was continued by Herschel’s son, John Herschel (1792-1871). Together they cataloged over 15,000 objects, which are still referred to with their NGC (New General Catalogue) and IC (Index Catalogue) numbers. In the 20th Century we learned that these nebulae are far outside our own galaxy and that they are distributed over a vastly bigger universe than ever imagined before. We will talk more about the implication of this discovery in future posts. 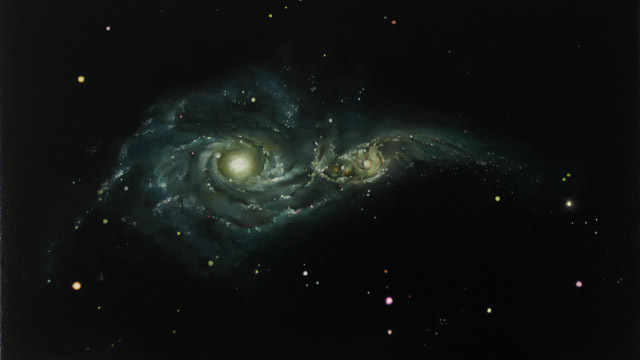 The Spiral Galaxies in the featured painting, (see the Creative Process), also known as NGC 2207 (bigger galaxy) and IC 2163 (smaller one), were first discovered by John Herschel in 1835. These galaxies are in the act of merging and are located about 150 million light-years away in the constellation of Canis Major. A light year is the distance light travels in one year and equal to about 9 500 000 000 000 000 meters. In a few billion years, they will merge into a single, larger spiral galaxy. Since the distance between any two stars in these galaxies is so vast, several light years, none of them will collide with one another during the merger. I only painted the visible matter but there is a larger, surrounding dark matter halo as well. We will continue with the history of modern cosmology, astrophysics and astronomy in the next posts, where we will also discuss physical concepts in more detail.